At Computex 2016, AMD has revealed some details about their upcoming Polaris graphics cards, in particular the RX 480. This card will be launching in June for just $199, with rated compute performance exceeding 5 TFLOPs. This new card isn't being positioned as a high-end competitor to Nvidia's latest products, but at this price it will certainly disrupt the mid-range market. 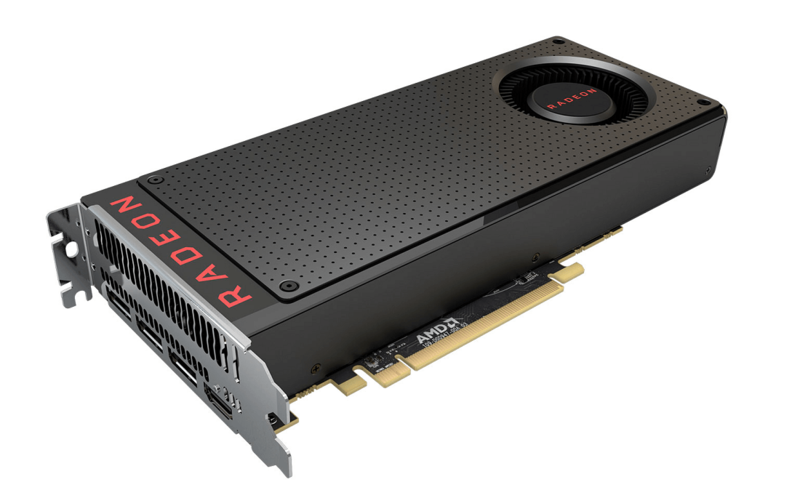 In comparison, AMD's own Radeon R9 390 provides just over 5 TFLOPs of performance but costs $329; the RX 480 is expected to exceed the performance of this card while costing $100+ less. Compared to Nvidia's cards, the RX 480 will probably slot between the GeForce GTX 970 and GTX 980: cards that also retail for well over $300 right now. Some of the RX 480's specifications are known. The card will feature 36 compute units for 2,304 stream processors, and a TDP around 150W. There will also be a 256-bit GDDR5 memory system providing 256 GB/s of bandwidth to either 4 or 8 GB of VRAM. AMD says the Polaris GPU in this card is manufactured using a 14nm FinFET process. We won't be seeing AMD's new high-performance cards until later on – the last-gen R9 Nano achieves over 8 TFLOPs, which is still well above the RX 480 – but we are starting to see what Polaris is made of. This card is set to reduce the cost of entry to virtual reality, which was one of AMD's main goals with their new architecture.